Club Amphora is unique type of place in Belgrade, providing an exciting experience to its guests since 1998. This river club is located in Bulevar Nikola Tesla bb Street, and undoubtedly the right choice for hedonists and true food lovers. 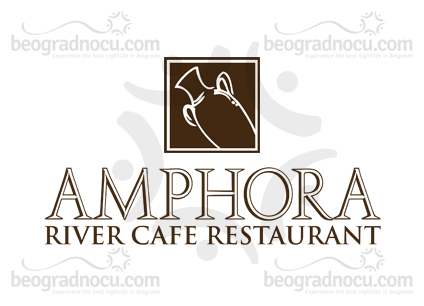 River club Amphora is very classy and pleasant restaurant, where you can enjoy in specialties, such as fresh marine and river fish, but also international cuisine with wide selection of vines and delicious desserts. Professional chefs will do their best to so you can enjoy in your order , not only with your taste, but also in aesthetic moment of your food, because everything here is served in very creative and inspiring way. The kitchen of club Amphora is full of people very devoted to their work and doing it with lot of love. The main focus is on fresh marine and river fish, warm Mediterranean plate, smoked beef, and excellent choice of goat cheese and cheese from Hercegovina, then chicken with prawns and many other things, which are inevitable, when it comes to perfection. As far as for dessert, special offer is Oplenačka pie, gratinated pancakes and homemade chocolate cake with raspberries. Besides an exceptional cuisine, you can enjoy maximally in very pleasant interior, which makes club Amphora a place, where you can spend a quality time with your family, friends and business partners. In winter days, club Amphora, offers you a warm interior with fireplace and guarantees you enjoyment with your loved ones. Interior is designed according to high standards of comfort. In club Amphora, a special attention is given to comfort, illumination and the whole atmosphere, subordinated to your desires. Warm tones of modern furniture combined with neutral colors, are perfect recipe for relaxation. The another special thing about club Amphora is that on Thursdays, Fridays and Saturdays you can enjoy in live band performances. During these days, restaurant is open even to 3 am, and the beginning of gig starts at 9 pm. Whit a carefully chosen music repertoire and incredible vocals of amazing singers, real fun never stops here. Music like rock, pop, evergreen and jazz is not unusual for this place. Amphora is delicious breakfast, lunch and dinner: breakout of enjoyment and stimulating business ideas, Amphora is your ideal of relaxation. Sophisticated and elegant place like Amphora is definitely right choice for people who share common desire for enjoyment. Fifteen years of experience in providing quality services, positioned club Amphora on a prestigious place where every visit becomes an experience.